Help Umbacano, a collector of ancient artifacts, recover the "Ten Ancestors", a set of ancient Ayleid statues. Find an Ayleid Statue and sell it. Find and talk to Umbacano. Recover the nine remaining statues. To begin this quest, find an Ayleid Statue. There are ten in total, one in each of the Ayleid ruins listed in the section below. Selling this statue to a merchant will net you a maximum of 250 septims. The statue disappears from the merchant's inventory as soon as you exit the barter screen. After selling the statue, expect to be approached by a messenger after a short period of time. The messenger will take you to Umbacano's Manor in the Talos Plaza District, where you find out that he has purchased the statue from the merchant. Alternatively, take the first statue directly to Umbacano. Enter his manor and show the statue to his butler, Jollring, who will then introduce you to Umbacano. Umbacano will then buy the statue for 500 gold, which is double its base value. You learn from Umbacano that the statue is one of the Ten Ancestors, statues that once resided in the Temple of the Ancestors, now known as White Gold Tower. 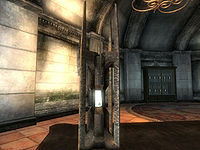 Before the fall of the Temple to the rebellious Cyrodiil, the statues were removed for safekeeping and held within ten different Ayleid cities. He wishes to acquire the full set of ten, but he lacks a resourceful treasure hunter. To continue this quest, search Ayleid ruins until another statue is found - see the section below for locations. When the second statue is sold to Umbacano, he will say that his research has discovered five Ayleid settlements he believes statues were taken to—Moranda, Mackamentain, Wenyandawik, Ninendava, and Fanacas. Map markers for all of these will appear on the map, but you will have to travel there manually unless you have been there before. Once the third statue is sold to him, he will give you another assignment as well: the quest Nothing You Can Possess. He will pay 5,500 gold when the tenth statue is delivered (500 for the statue, plus a 5000 bonus for completing the set). WARNING: It is recommended to find and sell all ten statues to Umbacano before starting Secrets of the Ayleids, which follows Nothing You Can Possess. After the completion of Secrets of the Ayleids, The Collector cannot be completed successfully. Find the words "The Yellow Road" on your map. It's the road running from The Red Ring Road (around the Imperial City) to the eastern side of Leyawiin. This ruin is located near the letter "T" in the words "The Yellow Road." North of the "Ch" in "Cheydinhal" on your map. There is a small lake located just to the left of the word "Basin" in "The Nibenay Basin". On the northwestern shore of this lake is this ruin. Just south of "The" in "The Orange Road." Just east of Sancre Tor, or northwest from Moranda and about half-way to Hermaeus Mora's shrine. Directly across the water from where you exited the Imperial Prison sewers at the start of the game. There should be a smaller river southwest of the words "Panther River" on your map, follow that body of water up to the actual Panther River and where they meet is Welke. If you look at your map, Wendelbek is directly north of the "nt" in "Panther River." Find "The Black Road" just south of Chorrol. Directly south from the "ac" in "Black" is Wendir. Directly northwest of Hackdirt. South of the "R" in the "Road" portion of "The Green Road" which is northwest of Bravil. In the unpatched version of the game, be careful with the Ayleid statues. If you place them on the floor of a house, especially Rosethorn Hall in Skingrad, they tend to fall through the ground after some time. Keep in mind that the statues are perfectly safe once placed in Umbacano's cabinet. In the patched version of the game, there seems to be no problem storing the statues in houses. The first statue that is sold to Umbacano is placed on his desk. When you find a second statue, the first one is moved from his desk to the Ayleid Statue Display cabinet, on the northeast side of his Private Quarters. Thereafter, every statue sold to Umbacano is placed directly into the display cabinet once you end the conversation with him and give him a chance to deposit the statue. Normally, at the end of the quest all ten statues end up in the display cabinet. However, if you find two or more statues before selling the second to Umbacano, the first statue will stay on his desk and only nine statues ever make into the display cabinet. You can steal the statues back from Umbacano at any time. However, you cannot sell them back to Umbacano. The Ayleid Statues are not affected by Telekinesis spells, but you can use "grab" to place them for display. The first edition of the Prima Official Game Guide lists Sardavar Leed as a location containing an Ayleid Statue. However, there is no statue in Sardavar Leed. 10 I've received a note from a man called Umbacano; he's interested in the Ayleid statue I found and sold. I should find him in the Imperial City and see what he wants. 15 I've spoken to a collector of Ayleid artifacts named Umbacano. He has offered to pay me handsomely for any Ayleid Ancestor statues that I bring him. 20 Umbacano has offered to pay well for any more statues I find. I should look for more of them in Ayleid ruins, and bring them to him. If I can find all ten of the statues, he will pay me a large bonus. 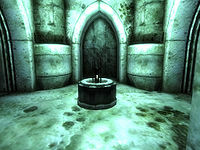 40 Umbacano's research has uncovered evidence that some of the Ayleid statues he is looking for may be hidden in these ruins: Moranda, Mackamentain, Wenyandawik, Ninendava, Fanacas. 52 I have brought Umbacano a second Ayleid statue. 53 I have brought Umbacano a third Ayleid statue. 54 I have brought Umbacano a fourth Ayleid statue. 55 I have brought Umbacano a fifth Ayleid statue. 56 I have brought Umbacano a sixth Ayleid statue. 57 I have brought Umbacano a seventh Ayleid statue. 58 I have brought Umbacano a eighth Ayleid statue. Only two more to go. 59 I have brought Umbacano a ninth Ayleid statue. If I bring him one more he will pay be [sic] a bonus of 5,000 gold. 60 1Yes I have brought Umbacano all ten of the Ayleid statues. He was very pleased and rewarded me well. It is possible to use the console to advance through the quest by entering setstage MS21 stage, where stage is the number of the stage you wish to complete. It is not possible to un-complete (i.e. go back) quest stages. See SetStage for more information. Esta página foi modificada pela última vez à(s) 15h32min de 3 de julho de 2014.